The Financial Crisis is knocking our doors, locally and internationally. This is something no one can deny. Are you well prepared to face it in order to secure your financial situation during this crisis, and even more: to benefit from it? 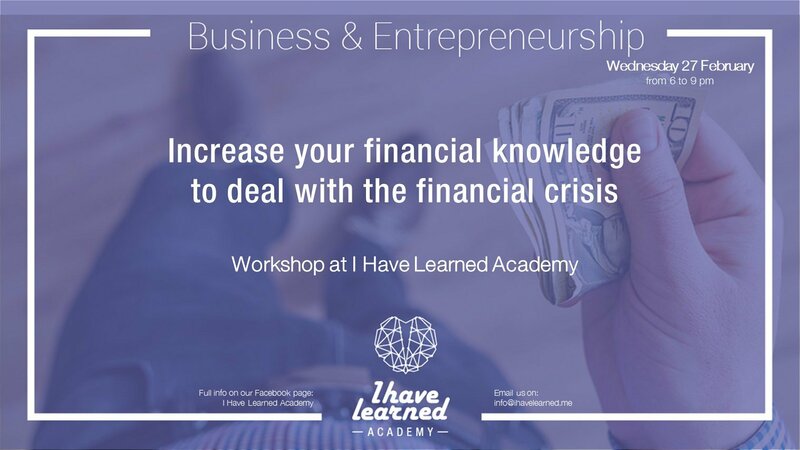 Meet us at I Have Learned Academy to know more about How you can deal on a personal level with such financial crisis. 2- The Common Trap: Know how to measure your REAL INCOME (avoid being trapped by spending your NORMAL INCOME). 3- How to evaluate your current financial situation. 4- The 3 financial categories of people and their differences (why they are different?). 5- Currency risks, banks functioning, is your Money safe? Book your seats asap as places are very limited. Abdallah H. is an economist and financial market analyst and founder of AH Financial Consultancy. Or in any branch of Khoury Home, Maliks and at I Have Learned Academy.